Fasteners are crucial to the long-term performance and aesthetics of your wood fence. There are many types of fasteners to choose from. How do you know which to purchase? In this post, we’ll provide clarity and help you make an informed fastener decision for your fence and application. We’ll break it into three categories – fastener material, nails or screws, and fastener length. The fastener material will be determined by the type of wood you’re using to build your fence. Some fastener materials and wood species don’t play well together, causing adverse reactions that compromise the appearance and structural integrity of the fence. Use our information as a guide and check the fastener manufacturer’s recommendations for compatibility with the wood you’re working with. For cedar fences, use stainless steel, aluminum or polymer-coated fasteners. Don’t use galvanized steel – the zinc in the fasteners may react with the acids in the cedar and create corrosion streaks. For pressure-treated wood, it’s crucial to use compatible fasteners because the preservatives used in the pressure-treatment process can adversely react with certain materials and cause the fasteners to corrode. With Outdoor Essentials® pressure-treated wood fencing, use hot-dipped galvanized, stainless steel, polymer-coated, silicon bronze or copper fasteners. These fasteners vary in price and durability, so choose the one best suited to your application. There are a variety of preservatives used for pressure-treating and they vary depending on the company that treats the wood. You can find out which preservatives are used in your pressure-treated wood fence by reading the end tag, which is typically stapled to the end of wood products. To ensure you are using the correct fastener material for your fence, follow the fastener manufacturer’s recommendations. Galvanized steel or other fasteners are acceptable to use with non-pressure-treated wood fencing. Because the wood is not pressure-treated, you do not need to worry about the fastener material reacting poorly to the wood. Which is better – nails or screws? The “nails or screws” question is really a question of preference. There are pros and cons to each. Nails are faster than screws to install, meaning less labor for you or your builder (which may translate into lower installation cost). However, nails are more likely than screws to grow loose over time. Screws, on the other hand, secure the fence better than nails. They also ensure easier rework should you need to replace a damaged picket. 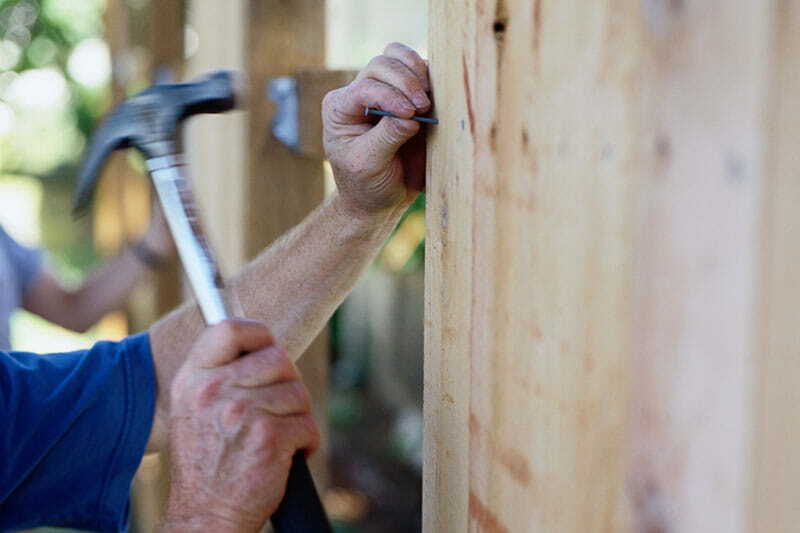 You can use both nails and screws on a wood fence – some builders attach the pickets to the backer rails with nails, then attach the backer rails/panels to the posts using screws. Whether you choose to use screws or nails, the length is crucial to the success of your fence. To attach preassembled panels or backer rails to posts, we recommend 18d to 20d nails or 3-1/2 in. to 4 in. long screws. To attach individual pickets to the backer rails, we recommend 8d to 10d nails or 1-1/4 in. to 1-3/4 in. long screws. There are many fastener options out there, but the decision can be easy with a solid understanding of the wood you’re working with and a knowledge of how you want to build your fence. Want to learn more about Outdoor Essentials wood fence? Check out our product page for details.